Florent Colautti was born in Les Landes forest, in his native country he studied classical music and architecture. Later on, he has studied electroacoustic and instrumental composition obtaining a DEM of the school music of Bordeaux. He continued his musical training in Paris with P.Leroux, T. Blondeau and R.R.Larivière. As a composer he has attended workshops in France and abroad with well known professors and artists. 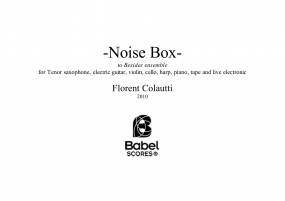 Coluatti is an associate composer of the SCRIME, he has worked with the Mobilis-Immobilis company, with the Proxima Centauri ensemble, with Besides ensemble, the Muse en circuit, and other recognized artists and bands projects. 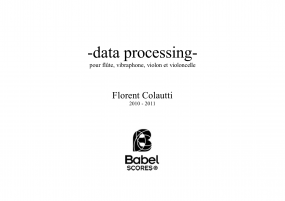 His works relate sound-arts, composition and live electronics performance. 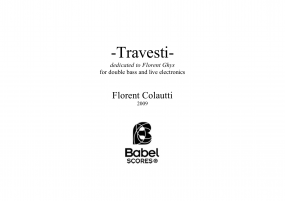 Coluatti's music has been performed in France and abroad. In 2009, he won a SACEM prize and the first prize on the composition competition Vacances percutantes with a percussion quartet.